As long as we are still in this world of sin, we may expect to see a counterfeit of everything that is genuine. Thus we shall continue to see false reformations alongside the true reformation. “I saw that the mysterious signs and wonders and false reformations would increase and spread. The reformations that were shown me were not reformations from error to truth.” – Early Writings, p. 45. In this lesson we shall deal with the positive side of this question and present the characteristics of a true, divinely authorized reformation. In the time of ancient Israel, God made a covenant with His people. 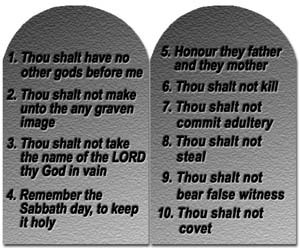 The foundation of this covenant was the Ten Commandments, the law of God. The apostle Paul said of the Jews: “Thou that makest thy boast of the law, through breaking the law dishonourest thou God?” Rom. 2:23. God’s present-day people find themselves in much the same position as ancient Israel. To indicate that the relationship between God and His people in this present day has not changed, we read Revelation 12:17, “. . . . which keep the commandments of God. . . .” This shows that the last people of God observe and teach the Ten Commandments. “God’s remnant people, standing before the world as reformers, are to show that the law of God is the foundation of all enduring reform. . . .” – Prophets and Kings, p. 678. “The law of God is the foundation of all enduring reformation. We are to present to the world in clear, distinct lines the need of obeying this law.’ – Testimonies, vol. 8, p. 199. (1) After Israel’s apostasy in worshiping the golden calf, which was a direct transgression of God’s law, Moses called for a reformation: “Who is on the Lord’s side? let him come unto me.” Exodus 32:26. (2) The various God-fearing judges and kings of Israel and Judah instituted mighty reformations because heathen deities were worshiped – in transgression of God’s law. (3) Elijah, standing on Mount Carmel, pleaded with the people, “How long halt ye between two opinions? If the Lord be God, follow Him: but if Baal, then follow him.” 1 Kings 18:21. The transgressors of God’s law have always challenged His supremacy. “Above all else, Ezra was a teacher of the law, and as he gave personal attention to the examination of every case, he sought to impress the people with the holiness of this law, and the blessings to be gained through obedience.” – Prophets and Kings, p. 622. (5) Christ, the world’s foremost Reformer, restored true commandment keeping. He said, “Why do ye also transgress the commandment of God by your tradition? . . . Thus have ye made the commandment of God of none effect by your tradition.” Matt. 19:17. (6) Martin Luther firmly opposed the selling of indulgences, which strikes against the law of God. And the last remnant church, as mentioned earlier, “which keep the commandments of God” (Rev. 12:17), “shall build the old waste places, ” and be “The repairer of the breach” made in the law. Isa. 58:12. Summarizing this important factor, we must conclude that a reformation is always solidly based upon obedience to the commandments of God. Whereas the Seventh-day Adventist people have always been identified as the people of the end times depicted in the Bible, there is a special characteristic singled out in prophecy to pinpoint the remnant people of God in these last days. Revelation 12:17. . . The testimony of Jesus Christ. Revelation 19:10. . . The testimony of Jesus is the Spirit of prophecy. “‘I took the precious Bible and surrounded it with the several Testimonies for the Church, given for the people of God. '” – Testimonies, vol. 5, p. 664. “Regarding the testimonies, nothing is ignored; nothing is cast aside; but time and place must be considered. Nothing must be done untimely.” – Selected Messages, Book 1, p. 57 (emphasis ours). In studying certain statements of the Testimonies, we should carefully consider how the particular testimony is supposed to be applied. We should ask the following questions: To whom was it written? When was it written? For what purpose was it written? What were the times and circumstances under which it was given? Only then will we be able to see the true picture that was conveyed by the Spirit of God through His servant. “. . . Ask for the old paths, where is the good way, and walk therein, . . .” Jer. 6:16. All divinely authorized reformations in the past have led back to the old paths from which the people had strayed. True reformation, as the very word itself implies, signifies a “forming anew.” When the people are led away from the pure standard of truth by deteriorating, deforming influences, the Spirit of God has always sought to restore them and bring them back to the former glory of God and to His unadulterated truth through reformation. Elijah, the great reformer (1 Kings 18:30), did not build an entirely new altar, but instead restored the broken-down altar of God that was already there. This has always been the object and the duty of true reformation. “No line of truth that has made the Seventh-day Adventist people what they are is to be weakened. We have the old landmarks of truth, experience, and duty, and we are to stand firmly in defense of our principle, in full view of the world.” – Testimonies, vol. 6, p. 17. “I have been hoping that there would be a thorough reformation, and that the principles for which we fought in the early days, and which were brought out in the power of the Holy Spirit, would be maintained.” – Selected Messages, Book 1, p. 206. “Cry aloud, spare not, lift up thy voice like a trumpet, and shew My people their transgression, and the house of Jacob their sins.” Isa. 58:1. The true reformer will see clearly the true condition of God’s people; and although it is a hard, thankless, and unpleasant task, he will faithfully point out the wrongs of the people. “The true people of God, who have the spirit of the work of the Lord and the salvation of souls at heart, will ever view sin in its real, sinful character. They will always be on the side of faithful and plain dealing with sins which easily beset the people of God. Especially in the closing work for the church, in the sealing time of the one hundred and forty-four thousand who are to stand without fault before the throne of God, will they feel most deeply the wrongs of God’s professed people.” – Testimonies, vol. 3, p. 266. “I asked the meaning of the shaking I had seen and was shown that it would be caused by the straight testimony called forth by the counsel of the True Witness to the Laodiceans.” – Early Writings, p. 270. Finally, there is a characteristic which is usually missing in false reformations but which is nevertheless very important. True reformers will be united on the firm platform of truth. “I asked the angel if there were none left. He bade me look in an opposite direction, and I saw a little company traveling a narrow pathway. All seemed to be firmly united, bound together by the truth, in bundles, or companies. Said the angel, ‘The third angel is binding, or sealing, them in bundles for the heavenly garner. '” – Early Writings, p. 88. “Some have advanced the thought that as we near the close of time, every child of God will act independently of any religious organization. But I have been instructed by the Lord that in this work there is no such thing as every man’s being independent.” – Gospel Workers, p. 487. 1. What may we expect to see in the religious world? 2. What is the basis of God's covenant with His people? 3. What special characteristics do God's remnant people have? 4. What six examples of the importance of God's law are given in the lesson? 5. What other characteristic distinguishes God's people? 6. What does the Bible tell us this is? 7. What is the proper place for the Testimonies in relation to the Scriptures? 8. What important questions should we ask when reading the Bible and the Testimonies? 9. What will true reformers always do? 10. What causes the shaking among God's people? 11. On what platform are true reformers united? 12. Will God have an organized work in the last days?